Suffolk County Police Marine Bureau officers, with assistance from a Good Samaritan, rescued two teens after their boat overturned in the Long Island Sound today. Smithtown, NY - June 20, 2015 - Suffolk County Police Marine Bureau officers, with assistance from a Good Samaritan, rescued two teens after their boat overturned in the Long Island Sound today. 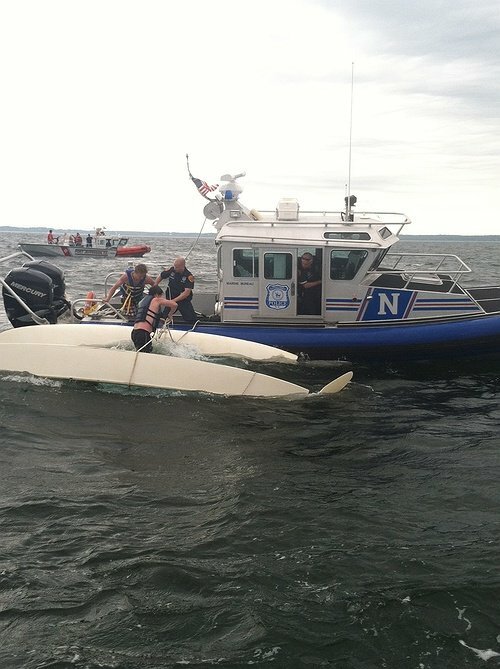 Douglas Botto, 19, of Smithtown, and Eric Damn, 19, of Smithtown, were on board a 16-foot Hobie Cat Catamaran on the Long Island Sound, approximately 2 ½ to 3 miles north of the Nissequogue River, when their boat overturned. Waves were three to five feet high and prevented them from righting the boat. A Good Samaritan located the two at approximately 11:30 a.m. after they had been floating on the boat’s hull with life jackets on for approximately 90 minutes. The Good Samaritan contacted the Marine Bureau over the VHF radio and provided their location. Marine Bureau Officers David Goldstein and Michael Cappiello aboard Marine Delta and Officers Keith Walters and Paul Carnival aboard Marine Bravo responded. They brought the teens back to Long Beach in Smithtown and towed the boat back. The United States Coast Guard was also on the scene. Subject: LongIsland.com - Your Name sent you Article details of "Smithtown Teens Rescued from Overturned Boat in Long Island Sound by Marine Bureau Officers & Good Samaritan"